The whole family was enjoying air-con in the study when Creme somehow curled into a corner whilst Cookie was looking at her. Within seconds, Cookie suddenly pounced on Creme, and use one of her paws to pin Creme down. We have seen Cookie doing this pinning action on another dog before. This is an act of dominance; she wants to dominate over the other animal. With Creme stuck in the corner, Cookie poured out a long scary bark at Creme. Creme screamed. 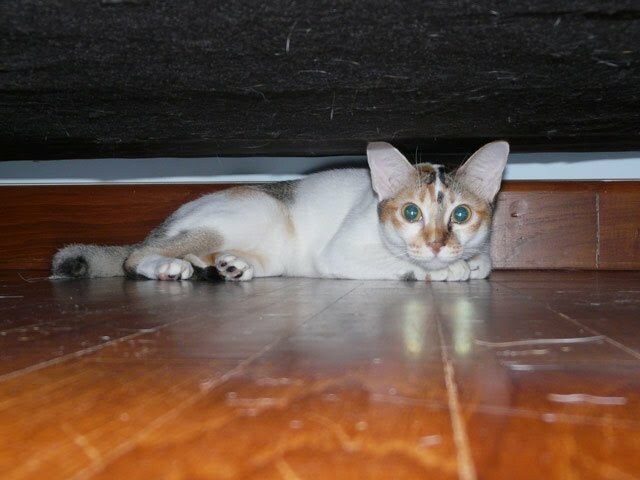 In the chaos, Creme managed to wiggle her way out of Creme's paw and ran underneath the day bed, looking terrified. This is not the first time Cookie bullies Creme like that. Cookie has come a long way. She used to be a puppy who jumped backwards when she came face-to-face with a cat. When Creme first came to our family, Cookie was so gentle with her. The turning point, I think, was during feeding time. Cookie likes to territorize over food. She gets jealous when Creme gets food. She doesn't think that anyone else need to be fed other than her. 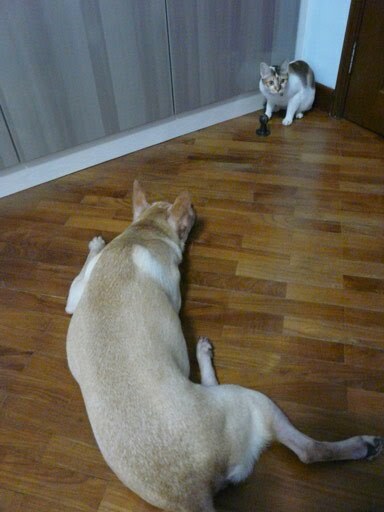 So, Creme won't dare to eat if Cookie is looking at her. If Cookie plays a toy, Creme won't join in until Cookie finishes with it. Cookie has truly established herself as the alpha female in this pack. The cat is the follower, although Creme fights back sometimes (quite fierce too). But, Cookie can be withdrawn sometimes. She goes underneath the desk and sits there for a long time. We think that she either enjoys looking at our legs or likes to socialize with the dustbin (which may have food residues in it). She does have this tendency (socialize with the dustbin) during party time.